The Dachshund is one of the most popular small dog breeds and popularity is increasing each year. Dachshunds are known to have sensitive digestive systems with dog food brands developing specialized formulas for the breed. The best dog food for dachshunds is the Royal Canin Dachshund Dry Food that aids in healthy weight management and supports joint health. Dachshunds require additional bone and joint additives in their dog food because due to their spinal structure and short legs, they suffer stress and pain on the spine. Many dog food brands focus primarily on this factor. 7.1 How Much Do Dachshunds Weigh? 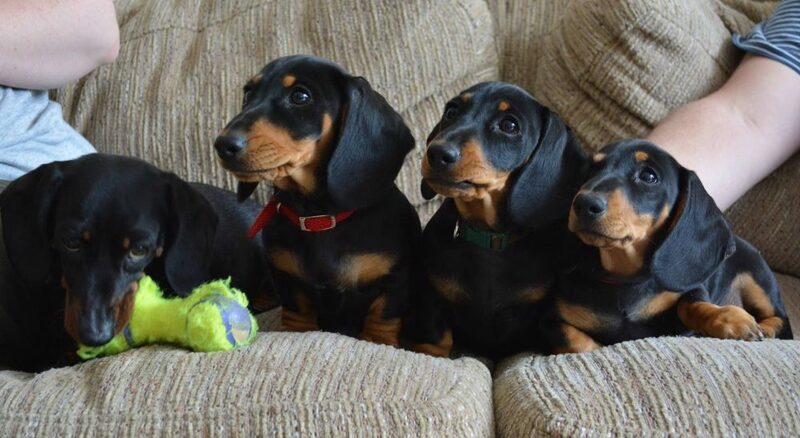 The dachshund breed has two variations that include standard and miniature, where the latter is more popular. Therefore, when feeding your dachshund dog food, read the instructions and fill their food bowl with the specified weight to food ratio. Dachshunds are often called Sausage Dogs and are much loved breed worldwide. However, they do suffer from health problems such as IVDD (Intervertebral Disc Disease), arthritis, back and dental issues. However, feeding them dachshund dog food ensures they are getting all the nutrients they require to fight back against issues. Choosing a dachshund dog food over a generic small breed alternative is highly recommended for a happy dog. Below is a list of the best dog food for dachshunds with all the nutrients and great taste for a happy dog. The Royal Canin brand is the most popular dachshund dog food by far and for good reason. 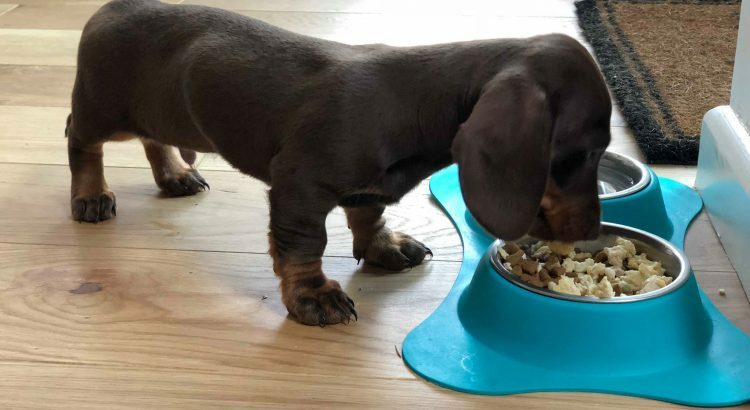 It assists with both bone and joint support and has a stool and odor reduction formula that really does make a difference to your sausage dog. For dog owners that count the calorie intake of their dachshund, the Royal Canin has 290 calories per cup of dog food. In terms of the nutrients, there is 26% crude protein, 12% crude fat and 4.1% crude fiber as the three main ingredients. Even the kibbles have been specifically designed for dachshunds with the reduction of dental plaque and tartar formation being top priority. You should introduce this Royal Canin dog food once your dachshund is over 10 months old for full benefits. Overall, it is the best dog food for dachshunds with every box ticked in terms of nutrients, value for money and kibble size. Owning a dachshund myself and speaking to many other owners, this is the dog food of choice for sausage dog owners. If your dachshund puppy is not over the age of 10 months, Royal Canin also offer a puppy dachshund dog food alternative. We are not sponsored by Royal Canin, it is just that they produce excellent dachshund dog food for all ages! Compared with the adult dachshund dog food, the puppy version has precise calcium and phosphors levels to ensure healthy bone and joint growths. It also supports the puppies digestive system and includes complex antioxidants. As the puppy will yet to have strong teeth and jaw action, the kibble is also developed exclusively for the smaller dachshund jaw. This make it easier for them to pick up and encourages even the most stubborn puppy dachshund to eat. If you have a new sausage dog pup, this is the best dog food for puppy dachshunds. The smaller kibble and additional ingredients designed for puppies is well worth paying the extra. Eukanuba offer a range of breed specific dog food with their dachshund breed specific food being quite popular. Their patented 3D DentaDefense system is proven to reduce tartar build-up in just 28 days, which is fairly impressive. It is a premium dog food for daschunds with high levels of L-carnitine and natural taurine for a healthy heart. It is the direct competitor to the Royal Canin alternative with both priced similar but if your dog is not eating the Royal Canin, it is recommended to try the Eukanba with its tasty real chicken flavor. If your dachshund is having dental related issues or refusing to eat the Royal Canin alternative, this is ideal. The Eukanuba is a top rated dachshund dog food that provides a high quality diet at an affordable price. As your dachshund ages, there dietary requirements will change as they will no longer require growth support but all round health. The Synergy Ultra contains high levels of fiber from flaxseed, oat, bletet pulp and other ingredients, which is exactly what a senior will require. It is estimated that up to 25% of dachshunds will suffer IVDD or other back related pains. Ensuring they have all the support from much needed nutrients is essential and should not be pushed aside for the cheaper dog food. Dachshunds have an average lifespan of between 13 and 14 where they are considered senior around the age of 10. To help them with the age related aches and pains, treat them with the Natural Balance Synergy dog food. Although the Blue Life formula is targeted towards small breeds and not dachshunds only, it is still difficult to not include it. It contains a tasty deboned chicken kibble rich with antioxidants, vitamins and minerals for maximum nutritional value. It is also a cheap dachshund dog food compared to the others in this article and is the very reason why its so popular among small breed owners. Overall, the BLUE Life Protection Formula Adult Dry Dog Food by Blue Buffalo is a highly rated cheap dog food for dachshunds to eat. It contains all the whole grains and complex carbohydrates that will ensure your sausage dog is full of energy. Dachshund are extremely affectionate and loyal small breed that are known to learn things quickly. They are very fun loving and playful but do like to be kept entertained. However, the main positive for owning a sausage dog is that they are relatively low maintenance. For example, everything is small so their small legs can only walk so far, there small stomach can only eat so much and so on. However, they are prone to spine, back and arthritis problems, which can be caused from jumping up and down tall objects. Overweight dachshund need to be even more cautious and without paying particular attention to their diet, they may be on a one way route to obesity, which is not good for their joints. To avoid an overweight sausage dog, the choice of dachshund dog food is crucial. Below are some factors that you should consider before purchasing any sausage dog food at a local supermarket. How Much Do Dachshunds Weigh? When feeding your dachshund, you should provide them with portions dependent upon their body weight. Standard dachshunds can weigh between 9 and 12 KG whereas miniature dachshunds weight between 3.6 to 5.0 KG. In terms of feeding your puppy, it is based upon their age than their weight and once they reach 11 months old, they are classed as an adult dachshund. When it comes to eating, dachshunds can suffer from terrible bloating due to have such as deep chest (also known as a keel). If you notice that your sausage dog is having bloating issues when eating their food then switch to another food that is easy to digest. On top of this, be sure not to exercise them of over excite them before eating as this will cause bloating too. The most common health issue for dachshunds is their backs with intervertebral disk disease (IVDD) being the most common. Thankfully, many charities are gathering money to help pay for troubled dachshunds but it is an issue that affects almost a quarter of all sausage dogs. To prevent back issues, it is crucial you maintain a strict diet and measure the food so they are getting the correct amount for their build. It is worth mentioning that dental problems to arise from time to time and if this is the case for your dog, be sure to try out food focusing on dental health. Dachshunds are a popular and loved breed worldwide but you do really need to keep an eye on their eating habits and weigh them a lot. Extra stress on bones and joints is something you will want to avoid for long term health of your dachshund. When buying dog food for dachshunds, it is always recommended to purchase a breed specific type. Compared to the generic small breed foods, a dachshund specific will include additional nutrients that they require for good well being. The top 3 in this article are aimed at dachshunds are are top rated dog foods to keep your sausage dog happy.